Benjamins Estate Agents are pleased to present to market this FOUR BEDROOM DETACHED property situated in a sought after cul-de-sac location in the popular village of Cotgrave on Fern Lea Avenue. The property is within easy reach of excellent facilities including shops, schools, churches, a leisure centre and Cotgrave Country Park. 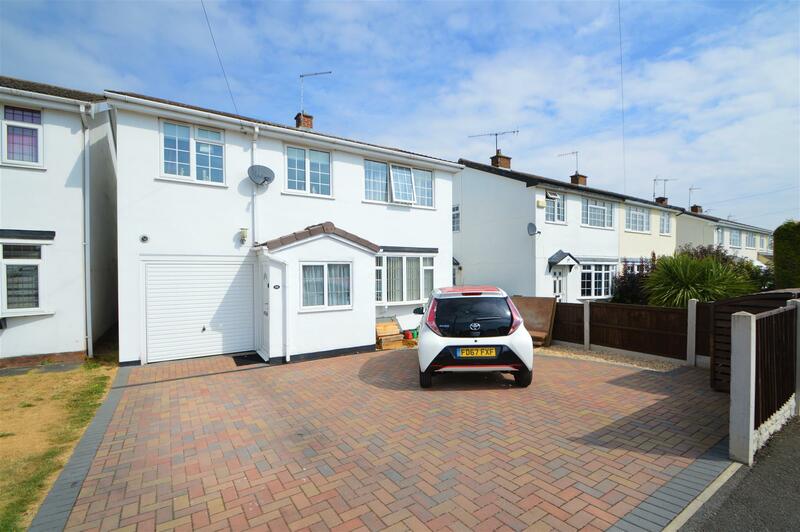 It briefly comprises; Entrance Porch, Living Room, Open Plan Kitchen, Dining / Family Area, Utility Room, Downstairs WC, Master Bedroom with Ensuite Shower Room, Family Bathroom, Four Bedrooms, Integral Garage, Enclosed Rear Garden & Block Paved Driveway to Front. UPVC double glazed windows to the front and side aspect, wood flooring, ceiling light point, door into the living room. UPVC double glazed bay window to the front aspect, feature gas fire set in surround, ceiling light fitting, radiator, stairs off to the first floor, glass panelled double doors leading to the open plan kitchen. The kitchen area is fitted with a range of contemporary cream gloss fronted wall & base units with Quartz roll edge work surfaces over and tiled splash backs, inset single drainer sink unit with mixer tap, integrated fan assisted oven and induction hob with a feature stainless steel island style extractor hood over, integrated fridge and dishwasher. Under cabinet lighting, wood flooring, UPVC double glazed window to rear elevation, ceiling spot lights, under stairs storage cupboard. Open plan to the dining & family area. UPVC double glazed French doors with glazed side panels lead to the rear garden, two Velux windows, wood flooring, television points, ceiling spot lights. Fitted with a range of cream gloss fronted units to the wall and base with Quartz roll edge work surfaces over and tiled splash backs, plumbing for washing machine, space for a condensing dryer. Ceiling spot lights, radiator, UPVC double glazed window to the rear aspect, wooden flooring, door to the garage, UPVC door giving access to the rear garden. Low flush wc and wash hand basin. Tiled splash backs, ceiling spot lights, wood flooring. Ceiling light point, loft access hatch (to the part boarded and fully insulated loft space), feature wood and glass panel banister doors with access to four bedrooms and the family bathroom. 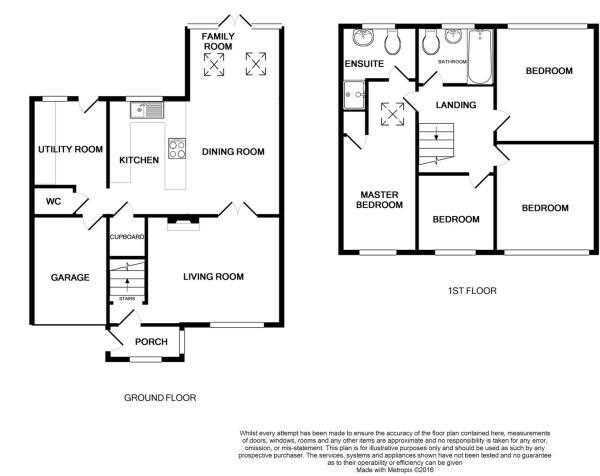 Feature vaulted ceiling, spot lights, Velux window to the rear, UPVC double glazed window to the front aspect, radiator, large storage cupboard, TV point, access to the ensuite. Fitted with a three piece suite comprising a shower enclosure with mains shower, a low level wc, wash hand basin. UPVC double glazed window to the rear aspect, tiled flooring with under floor heating, heated towel rail, fully tiled walls, ceiling spot lights. UPVC double glazed window to the front aspect, ceiling light fitting, radiator, carpet. UPVC double glazed window to the front aspect, ceiling light point, radiator, carpet. Fitted with a three piece suite comprising a panelled bath with hand held shower, a low level wc and pedestal wash hand basin. Half height tiling to walls, tiled flooring, chrome heated towel rail. Ceiling light fitting, UPVC double glazed window to the rear aspect. To the rear of the property the garden includes a large patio seating area with a shaped lawn beyond. Enclosed by timber fence, the garden has an external tap and light, a timber shed and secure gated access to the side and front of the property. There is a block paved driveway providing off road parking for several vehicles at the front of the property, also giving access to the entrance door and garage. In addition there is a half height timber fence to the boundary and timber store for the bins. With an up and over door, tap, power & lighting, housing the wall mounted combination boiler. The local authority Rushcliffe Borough Council has advised us that the property is in council tax band D, which we are advised, currently incurs a charge of £1918.38 (2018/19). Prospective purchasers are advised to confirm this.